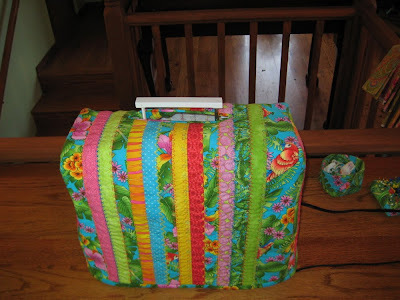 I made up a tutorial for a custom-fit sewing machine cover and it's on my FlickR site. I'm going to leave it there for now just because I'm too lazy to move everything over here. :) Anyway, I'll walk you through making a cover from measuring it and figuring out how big to cut your fabric all the way to making an opening for your handle and cords, if you so choose. Let me know if you have any questions or comments or corrections. Thanks! I just recently found your blog. I came over on a link form Tip Nut for your sewing organizer. I am absolutely in love with color too and enjoy sewing so I feel right at home. I am in the process of reading through your whole blog. :) I borrowed a sewing machine to finish up Christmas presents as mine is on the fritz. (I teach home ec at a small school and bring my machine in for the students to use. Some how the needle won't go down into the hole. It is off kilter somehow. Now I have to go get it fixed) Anyway I thought I would make a cover for the borrow machine and return it with that. Isn't that a great idea? I will take pic of it to show you as I plan on adding an elastic edged pocket to the front, and maybe put elastic at the bottom. (her base that comes off for sewing narrow things like sleeves falls off at will so that may keep it in place while carrying it.) So I am off to Hobby Lobby as they have a lot of really cute fabric and it is 30% off this week. Yay!